Sep. 11, 2017 1:49 p.m.
Alicia “Buckskin Ali” Massie is currently preparing for the Rocking Heart Ranch Colt Starting Challenge that takes place on September 16 in Fort Macleod, AB. 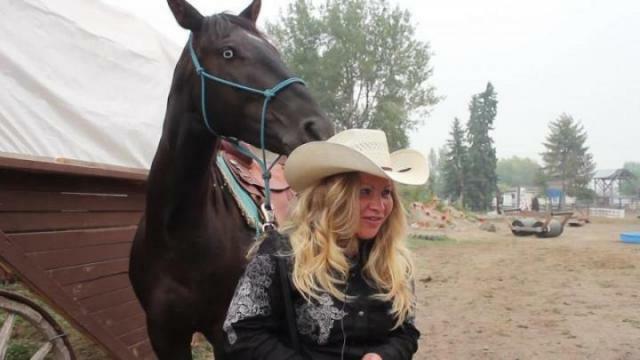 She has been given 60 days to train Frosty, the horse she drew randomly from a hat, and it is an opportunity for the 28-year-old Fort Steele resident to be chosen as one of the top ten trainers in Western Canada. This type of competition showcases the importance of training young horses by highlighting a trainer’s ability to teach their horse fundamental techniques like loading into a trailer, gait control and bridle manners. “It’s everyday ranch work that you would do and you try to do it as soft as you can,” Massie explained. There is also a freestyle segment at the end of the competition that allows the trainer to demonstrate all extra training they have taught their horse. Massie for example has taught her horse to lie down on command, walk through dark pools of water and to let her stand up on top of his back. Massie has been riding horses since she was 12. After taking around two years off from riding when she sold her first horse, she got back into it when she came to train at her uncle John Soles’ ranch where she has been ever since. Massie runs her own business as well, called Buckskin Ali Horsemanship. She earned the nicknamebecause when she first competed in the Colt Starting Challenge, she drew a buckskin horse from the hat, and buckskin just happened to be her favourite colour. Looking forward, Massie plans to continue on this upwards trajectory, training horses, competing and developing her business. The horses are auctioned off after the competition.